Trick or treat? We say treat yourself! It’s Halloween! A day for celebration, relaxation, fun, and colorful masks. Your loop might not like pumpkin juice or masks, but it doesn’t mind a colored fluid to show off it’s Halloween spirit! Time for the customary trick or treat, so when you ring our doorbell – we pick treat! 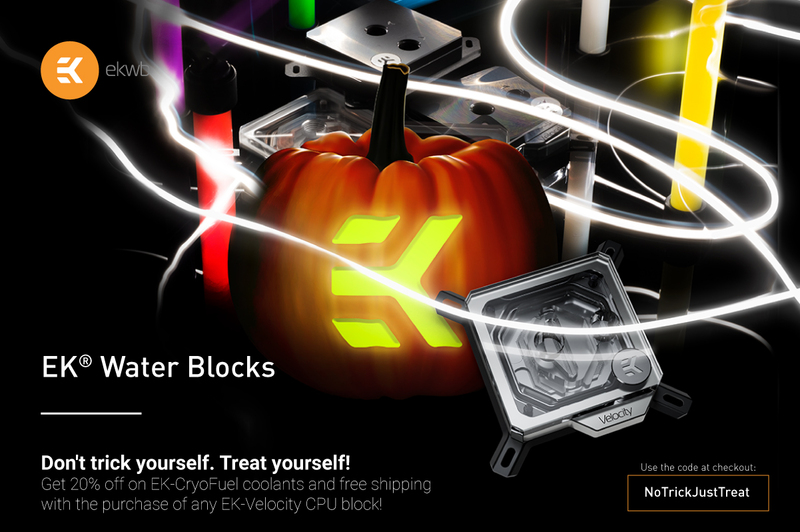 – a 20% off coupon code for EK-Cryofuel coolants and free shipping with every purchase of EK-Velocity CPU block! The promotion is valid until Sunday, 4th of November, 2018. Remember, the code can be applied only if you have an EK-Velocity block in your cart! The discount value applies only to the total value of your EK-Cryofuel coolants! Don’t forget to choose the free shipping option when you apply the code!